The RTA works to keep tie markets strong and healthy through active and responsible promotion of the wood crosstie, product improvement engineering, communication across the rail industry network and a steady flow of useful information published in Crossties. RTA's mission is to enhance the potential for our members' products and be sure those products meet the market's demands. The RTA is the network designed to expand tie markets domestically and globally. 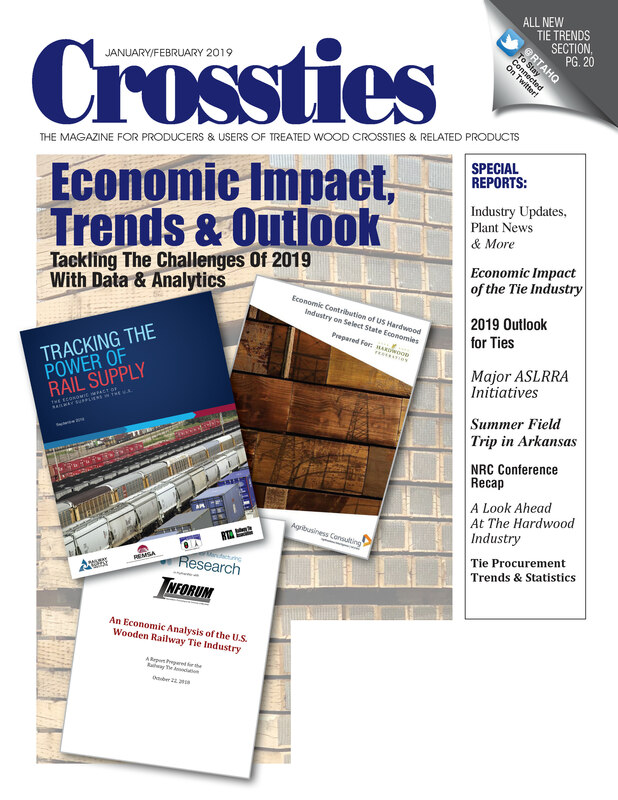 RTA publishes the highly regarded bimonthly magazine, Crossties, which covers all aspects of the wood crosstie industry. Membership in RTA entitles you to receive this publication at no additional charge. Selected articles from Crossties Magazine are also available online. Below is the list of issues currently available. including the economic forecast and 2019 tie outlook, ASLRRA initiatives, and Hardwood Federation update ! The Tie Grading Seminar is Coming! 2005 Field Trip - "Sweet Home Alabama"
Stop! Go! Proceed with ...Optimism?